Can this be the Rockets’ season, finally? The last time the Houston Rockets lost to the Golden State Warriors in the Conference Finals, they suffered a two-year hangover. That shouldn’t happen this season. It can’t, happen. Chris Paul will soon break the 35,000-minute mark for his career. Besides, point guards with bad knees tend to not age very well. Likewise, league MVP James Harden is playing his 10th NBA season, and while he is, undoubtedly, still in the prime of his career, how long will that last? Point is, the Rockets’ window is now. They have the right superstars, the right coach in Mike D’Antoni and most of the right supporting cast. It’s not a perfect team, especially with the Warriors lurking, but it’s close enough to have a championship-or-bust mentality until the Harden-CP3 window closes. This year’s case Rockets reminds us of the 2014 San Antonio Spurs. After infamously letting the 2013 NBA Championship slip from their grasps, the Spurs brought back essentially the same roster in 2013-14 and played with a laser-sharp determination to avenge their Finals loss all season, which they did in a lopsided Finals rematch with the Miami Heat. Like this year’s Rockets, many people figured that those Spurs had missed their window of opportunity and would regress after losing in such heartbreaking fashion. When the Finals loss had the inverse effect, everyone realized they should have seen the revenge season coming. A revenge season – that’s the Rockets’ case to win the championship in 2018-19. The 2017-18 Houston Rockets were one of the better teams in the past decade. 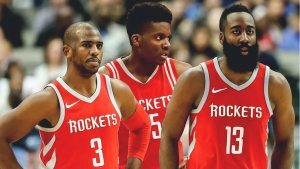 For a significant stretch of the season, they had the best offense in NBA history along with the league MVP in Harden, best pure point guard in basketball in Paul, an elite rim-runner in Clint Capela and the three-and-D wings equipped to offset the Warriors -- Trevor Ariza, Luc Mbah a Moute and PJ Tucker. They were better than the Warriors during the regular season and better than the Warriors through five games of the Western Conference Finals. Heck, they were better than the Warriors, too, for the first halves of Games 6 and 7. They just weren’t better when it mattered the most. Have they learned from that wasted opportunity? The Rockets didn’t quite run it back from last year, as they lost Ariza and Mbah a Moute in free agency. Replacing those two important cogs in their rotation are James Ennis III, Carmelo Anthony and a handful of castoffs from the Suns. While Ennis looks to have a better season and Anthony has looked a little like Olympic ‘Melo this preseason, the team’s switchability on defense is nowhere near what it had last season. It probably won’t matter much during the regular season because the Rockets will just outscore everyone. But come May, they’ll need to have an answer to the question as to who is going to guard the likes of LeBron James and Kevin Durant in the playoffs? Can they trust Ennis to step up despite having never really gotten big minutes in a playoff game? One popular theory among Houston insiders is that the Rockets have at least one more major move in them, either via buyout or trade. By unloading Ryan Anderson’s contract to Phoenix, the Rockets will be able to take on extra money in the buyout market. A number of three-and-D wings might be available. Kent Bazemore, DeMarre Carroll and JR Smith would all fit nicely with Houston. And what about also the chance that general manager Daryl Morey finds a way to swing a trade for the disgruntled Jimmy Butler? Regardless of whom their last piece is, the Rockets will once again need superb seasons out of Harden and Paul. With the two of them playing Hall of Fame-level point guard for 48 minutes and professional scorers like Anthony, Eric Gordon and Gerald Green able to drop 25 any night, the team will always have a high-octane offense. How can the Rockets improve on heir ceiling depends n Capela’s development though. He was an excellent rim-protector and runner last season, averaging 14 points on the best field-goal percentage in the league, 11 rebounds and two blocks per game. Yet, he flashed the ability to be an even more complete player. If he improved his lateral movement slightly, the Rockets would be able to keep him in late games even when teams go to their small-ball lineups. The more the Rockets can play Capela together with Harden and Paul, the better. Click here to view a list of other articles written by Eddie Alinea.